Why do you must use Partmo filters? 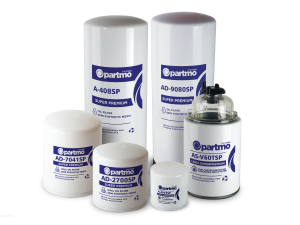 Partmo Super Premium Filters incorporate high-strength cellulose filter media, combined with high capacity synthetic micro-fibers for greater contaminant retention. Partmo Super Premium Filters meet all specifications: filtration capacity, efficiency and pressure drop. We ensure your engine is protected against solid contaminants, sludge, coal and soot. Partmo filters prevent oil degradation and engine wear on liners, tank valves, valve train, piston rings and additional components. Ensure greater protection for your engine by using Partmo Super Premium Filters. ﻿﻿﻿Your browser does not support iframes.